After a late start to Sunday at DUB Pies, Iggy and I made our way down to the super market to pick-up something for dinner. Right away I headed to the meat section to see if today was a cheap roast day. 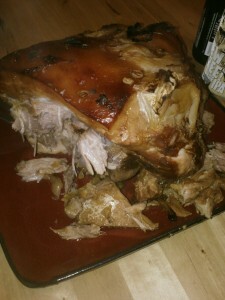 I wasn’t disappointed; pork shoulder was only $1.19 a pound. I’ve seen $0.89 a pound, but $1.19 is still a good deal. I grabbed a smaller, eight pound, slab of meat. Right away, I knew what the rest of the simple recipe would be. I came-up with this a few years ago when I was home visiting Minnesota and at mother’s house without a car. My mom had left me a pork loin and a recipe. Though she seemed to over look the fact that the house was missing half the ingredients in that recipe. Undeterred, I found some apples, onions, a bit of garlic, and a bit of apple cider vinegar. Put it all together in a ceramic roasting pan covered it and let the flavors come together. 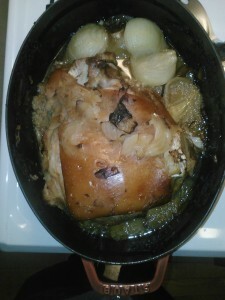 The result was a moist piece of meat, with a sweet apple sauce on the side, that has become my template for many a meal. Put the meat in a dutch oven (or some other heavy roasting device with a lid). If you have a pork shoulder, or other fatty cut of meat, be sure to put the fatty side-up so that the juices run down over the meat over the hours of cooking. 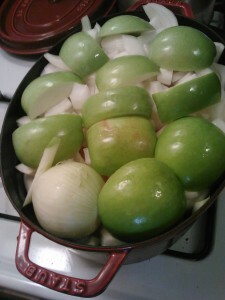 Cut some big chunks of apple and onions and fill in the sides and the space above the meat. It’ll be packed in there, but everything is going to cook way down. Throw in a bit of apple cider vinegar, maybe a quarter to half a cup. Add a little fish sauce. This is some what optional, but the umami in the fish sauce will help bring out the flavors. Tread lightly with this stuff though, while a few tablespoons will bring out the flavors, too much will be a disaster (take a wiff of the bottle and you’ll know what I mean). Give the garlic a rough chop and mix it in on the sides of the meat. Now cover this bad boy, put it in the oven, and let it cook for hours. For a pork shoulder, target maybe 45 minutes a pound. Uncover for the last 30-45 minutes or so to give the meat a nice crisp. The apple and onion cook way down and fall apart and mix with the pork dripping to form a sweet and savory apple sauce perfect for pork. After hours of cooking, the meat falls off the bone and practically shreds itself. As an added benefit, your home will be filled with wonderful Sunday cooking smells. After the Sunday night meal, you’re almost sure to have left overs. The shredded pork and sauce can then easily become a great pulled pork sandwich (just add some BBQ sauce) or some pulled pork taco. The Sunday meal that keeps on giving. So I realize it’s been a while since there’s been a post…. ok a long time, since Randy Moss played for the Vikings. But it’s time to get back to it. Anyway, on to the sushi talk! 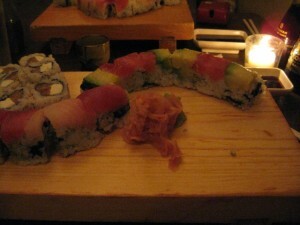 It’s easy to find cheap sushi in New York, though it’s not necessarily so easy to find good sushi on the cheap. All too often I’ve been tempted by seemingly amazing sushi specials, only to find tough, low quality cuts of fish or fish past its prime. 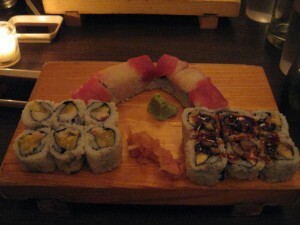 Cherin Sushi, however, offers delicious, fresh, and creative rolls at a bargain price. As you get to the door of Cherin, through the front window you see a simple black rock garden. Once through the door, you find yourself in a comfortably Spartan, long, dimly lit room. The sushi bar itself is at the far end of the long room. With only two seats, the small sushi bar, hard to see from most seats in the restaurant, may be Cherin’s biggest drawback. It’s always nice to have the option to sit at the bar, talk with chef, and see the sushi being made. Especially if you’re a regular talking to the sushi chef can sometimes get you the best cuts of fish and off the menu creations. If you swing by Cherin any evening Monday through Saturday you can get in on a sushi early bird special. Mondays, the specials run from 5 until midnight, Tuesday through Thursday the special is available from 5 to 8, and Friday or Saturday the special ends by 7:30. Get your soy sauce and wasabi ready for the “Diet Special”: three rolls or one roll with six sashimi pieces for $9.95; or grab the “Dinner Special”: four rolls or one roll with nine sashimi pieces for $12.95. Sure, the specials don’t include some of the fancy rolls; but they do have some deliciously innovative sushi on the list. Among the standard rolls, Cherin’s menu has some awesome house creations: the Sushi Surfer roll introduces banana to eel (an odd-sounding yet surprisingly tasty union), the Jenny roll puts a pineapple and shrimp combination in your chopsticks, and the Crunch roll adds some apple into a standard cucumber roll. 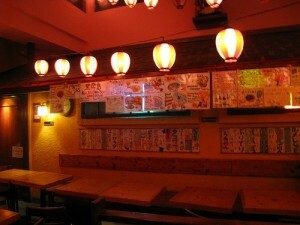 And during happy hour, be sure not to miss the generously priced beer and hot sake. Even if you think it’s lame to eat dinner before eight o’clock, don’t skip over this place. The non-happy hour prices still include quality rolls for less than the pre-package stuff you find in stores. But wait, there’s more. Cheri is BYOB with no cork or cap fee and has a great liquor store with top-shelf bottles of sake just down the block. The words, ‘Japanese food’ probably conjure up the thought of sushi. But at Village Yokocho, in Astor Place, a vast assortment of Japanese food is served with only minimal attention to sushi. The restaurant is in the izakaya (Japanese pub) style, with lots of small dishes—think Japanese tapas—that go fantastically well with beer. The tables are tightly packed in two windowless rooms where it feels like dusk no matter what hour. Though loud at times, the space manages to avoid feeling claustrophobic. The sheer number of menu options can be a little overwhelming at first and pre-dining research is hampered by Village Yokocho’s Ted Kazinsky approach to technology—the restaurant does not have a website or online menu. But, there is a huge amount of great food to choose from, so spend a little time in the beginning getting familiar with the large, various menu. Having eaten at Village Yokocho more times than any other restaurant in New York City, I have developed a little list of go-to menu items. 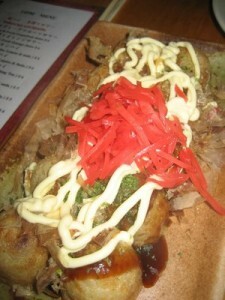 At the top of the list, octopus balls (takoyaki) are a must. From their roots in Osaka, the bready balls are about the size of a doughnut hole, consisting of soft dough encasing a couple pieces of octopus, then fried and dusted with bonito flakes. Served hot, the bonito flakes on top of the balls move and wave in the steam, making the dish not only an amazing savory concoction, but visually interesting as well. While this dish might sound overly adventurous to some, I can safely say it’s tame enough to satisfy the conservative Midwestern eaters that I’ve tried them on. The wasabi pork dumplings are another simple treat. Though be warned, the wasabi dominates the dumplings and packs a punch that might be too much for the faint of heart. Finally, the chicken, beef, and quail egg skewers bring a great grilled flavor that meshes well with any dish on the menu. 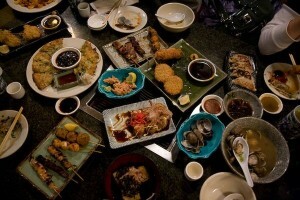 Even more than new flavors, Village Yokocho offers a chance to try new textures in food. With cheap prices for almost everything on the menu, each trip offers an opportunity to be adventurous. I highly recommend bringing a large party of adventurous eaters to maximize the variety of dishes to try. Not all dishes are simple to enjoy; some may be reserved for more rarefied tastes. For starters, take the tuna sashimi and yam paste. Though the tuna is along the lines of what you would find in a regular sushi meal, the yam paste has a sticky, slimy texture unlike anything I’ve ever eaten. It was worth a try, though I’ll not likely order it again. On my last visit I tried a spicy bean paste pork and tofu stew. While not scorching enough to be inedible, it still had a strong spicy flavor. Moreover, the fresh flavors of the vegetables were able to shine through the heat. Also, the dish was a variety of textures, including crisp mushrooms, soft potatoes, and fresh, snapping veggies. The Village Yokocho has one other hidden surprise: through a discreet door in the main dining room is the speakeasy bar Angel’s Share, where highly skilled mixologists prepare drinks from a seasonal menu or improvise based on the customer’s preferences. Though the drinks are pricey, they are high quality and worth the ambiance of a secret nightcap spot. Whether for dining or drinks, the Village Yokocho deserves not just a trip, but repeated visits in any New Yorker’s dining rotation.